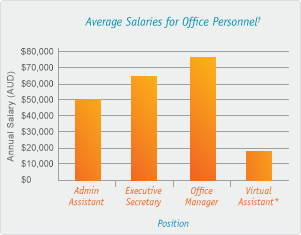 The Occasional Assistant is a Virtual Assistant company. A Virtual Assistant (VA) is just like a Personal Assistant, except that a VA handles your work remotely via phone, fax, email or post and from their own office. VAs have the skills of a Corporate Personal Assistant together with experience in a range of specialist fields: event management, transcription, proofreading, research etc. Virtual Assistants are the perfect solution for the busy entrepreneur, small business owner, telecommuter or student. One of the main attractions of using a VA is the cost benefit. A VA offers businesses the best range of office solutions at a fraction of the cost of a temp or employee. VAs don’t need employee benefits, superannuation, holidays, sick pay, overtime, bonuses, training, office down time, office space, coffee breaks or lunch breaks. When you compare the costs of using a VA with a full time Executive Secretary, Business Office Manager or Administrative Assistant, it is a much more cost effective business solution.